Don’t you love a free sewing pattern, especially when the pattern maker is modelling an awesome garment made with it? 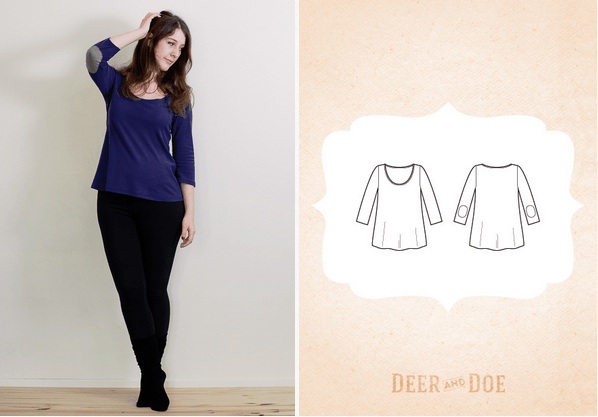 I was already impressed by Deer and Doe and their sewing patterns for women and not men men, but this new free t-shirt sewing pattern is really cool. You’d have to sign in to download it, but the pattern looks like it’s worth it. I’ve bought a thick raspberry-pink jersey in my last holiday and this looks like a good project for it. I really like Laurwyn’s post about body image. I think many of us don’t know how good looking they really are. We are taught and used to thinking females are only beautiful if they look like whatever the era’s models look like. Curvy, slim or supper skinny, tall, but not too tall, shorter than most males, but not too short etc. Instead of looking at ourselves, we look at what’s missing. It’s refreshing to change the tune for once. I like Sarai’s new project, Wardrobe Architect and the exercises she suggests. Week two’s assignment is creating a collection of images that describe your core style. Sarai takes you on a self-discovery journey of personal style and then helps you pick 5 words that best describe your style. Mine are tomboy, natural, comfortable, feminine, bicycle. Bicycle?? Why is that there? Well, I was struggling to find a fifth word to describe how I dress and since I use my bike everyday, that affects how I dress. That’s all from me, for now. How about you? What did you sew? What did you think about? What did you do this week?